November 17, 1978: A day that will live in infamy, at least for Star Wars fans. The Star Wars Holiday Special, a 2-hour TV show that aired on CBS, was intended to give fans something to bridge the gap between the summer 1977 release of A New Hope and the 1980 bow of The Empire Strikes Back. Various details were leaked beforehand: all the major characters from Star Wars would be in the special (played by the actors who originated them), a new character (Boba Fett) would be introduced, there would be an animated segment that would advance the Star Wars storyline, and various notable TV and pop stars (Bea Arthur, Harvey Korman, Diahann Carroll, Jefferson Starship) would appear. It sounded amazing. It was anything but that. Over the years, The Star Wars Holiday Special has gained a reputation as being a “so bad it’s good” cult classic. George Lucas (who, deep in preproduction for Empire, had no creative input into the special), recognizing almost immediately the horror he had unleashed, decreed that not only would it never be repeated or released on any home video format, but it would be stricken from the “official” records (although a few bits and pieces have made their way into canon over the years). As a result, the made-for-TV movie was unavailable for about two decades, seen only by those few who had recorded it during its first airing. It reappeared with the rise of YouTube – grainy, second or third-generation VHS dubs that allowed fans to relive the ugliness they dimly remembered. Surely, it couldn’t have been as bad as all that… but it was. For a while, Lucas tried valiantly to quash the YouTube copies but, even someone of his clout couldn’t triumph in the whack-a-mole game and, after Lucasfilm was sold to Disney, the new owner didn’t bother, as if tacitly allowing The Holiday Special to be seen by anyone willing to search for it. Dedicated fans, meanwhile, attempted crude restorations of the available copies and what exists today, while poor by professional audio/video standards, is of tolerable quality and watchable by anyone foolish enough to think they can endure its awfulness. If one was to watch only clips from The Holiday Special, it might be possible to believe it to be an unintentionally campy misfire that can be enjoyed for reasons having nothing to do with what the producers intended. Those clips, however, represent the “highlights.” They don’t capture the painful monotony in between: endless minutes of mundane Wookie family life, a holographic acrobat performing for what seems like hours, banal songs sung by Diahann Carroll, Jefferson Starship, and Carrie Fisher, a painful “instructional” video with Harvey Korman, and various other bits of tedious filler. One of the problems with The Star Wars Holiday Special is that it couldn’t decide whether it wanted to be a new adventure in the Star Wars universe or a variety show, so it compromised and tried to do both. Not a single “guest performance” works, although Bea Arthur (as the Tatooine Cantina bartender) and Art Carney (as a trader) at least give something resembling respectable performances – certainly they’re better than the material deserves. The “story” (to the extent there can be said to be a “story”) takes place on the Wookie home planet of Kashyyyk in advance of the annual Life Day celebration. Chewbacca’s wife, Malla (Mickey Morton), son Lumpy (Patty Maloney), and lecherous father Itchy (Paul Gale) are awaiting the famous rebel’s arrival when the Empire shows up to make things uncomfortable. Eventually Chewy (Peter Mayhew) and Han (Harrison Ford) arrive to save the day. Aside from Han, who gets a few minutes worth of “plot,” the other Star Wars characters are relegated to awkward cameos via viewscreens. Mark Hamill, who looks like the producers pulled him off a surfing movie set, calls Malla to wish her Happy Life Day. Carrie Fisher, wearing the Leia buns for the last time and having trouble hiding her boredom, tries to reassure Malla that the missing Chewie probably isn’t a problem. Vader’s appearance consists of a redubbed scene from Star Wars in which James Earl Jones provides new dialogue. The heroes finally appear together in a psychedelic scene at the end. With something like this, there’s a tendency to say “it has to be seen to be believed,” but that would be bad advice. The central problem with The Star Wars Holiday Special isn’t merely that it’s bad in every way imaginable – conception, development, execution, postproduction – but it’s boring. Watching Malla, Itchy, and Lumpy go about their daily routines (with no subtitles for Wookie “dialogue”) is as uninteresting as TV can get – it’s like Ingmar Bergman on LSD. Later, we’re subjected to three minutes of acrobatics and, after that, a supposedly “comedic” cooking show that Malla watches as she’s making her Life Day meal. 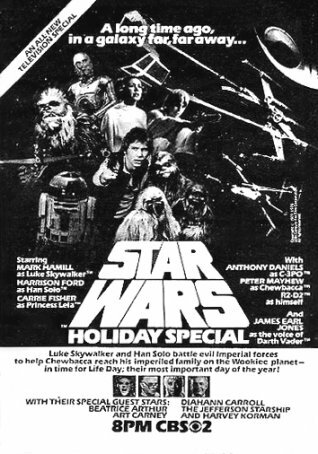 So, considering all this rottenness, how did The Star Wars Holiday Special earn a whole star? That’s because of the animated segment which, although not representative of the pinnacle of Star Wars cartoons, is at least diverting. It features a glimpse into one interpretation of the nascent Star Wars universe pre-Empire Strikes Back and introduces Bounty Hunter Boba Fett (whose character would undergo revisions before his first live-action appearance). Freed from the confines of the Star Wars Holiday Special, this short is more interesting for its historical value than for anything it adds to the franchise’s mythos. Made on what appears to be a shoestring budget, The Star Wars Holiday Special exchanges cutting edge special effects for cut-rate ones. All scenes featuring spaceships are clips from Star Wars and new material, like shots of the Wookie home, are obviously matte paintings. John Williams’ music is reworked from its original grandeur to something more appropriately bland for TV. Pretty much everyone seems bored, confused, stoned, annoyed, or some combination of the above – except Itchy, that is, who is too busy reminding us of a creepy grandpa doing unspeakable things under the dining room table. As for the writing – the program was cobbled together by a combination of comedy writers and variety show veterans. There’s not a single “serious” person among them and certainly no one familiar with science fiction in general or Star Wars in particular. Is it any wonder this went so wrong? Over the years, some Star Wars fans who didn’t see it when it first aired have pursued The Star Wars Holiday Special as a Holy Grail. After all, the more assiduously hidden and denied something is, the more desired it becomes. In this case, although Pandora’s Box is best left unopened, it’s impossible to deny the curiosity impulse. Just be warned that it’s worse than you can imagine (excepting the animated segment) and not nearly as fun as you might expect. Feel free to fast forward and skip ahead. You won’t miss anything and, if you do, it’s probably something you wouldn’t want to have seen in the first place – not unlike the special as a whole.